Looking for a VIP snorkeling tour? 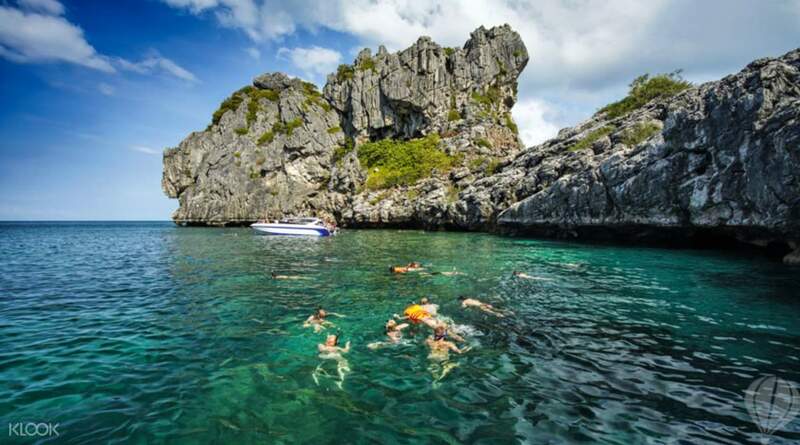 Check out the VIP Snorkeling Experience at Ang Thong Marine Park! Nice day tour. The kids had fun too. Kayaking was worth the extra. Food on the boat for lunch was tasty (but simple). Alas the sitting area for the majority of guets was very hot, though shady. The cooler area happened to be in the full sun in the smoking area. Only downside of the tour (not the fault of the boat operator) was the snorkeling. Last time I visited the snorkelling in the islands was much nicer and everyone didn't "need" to wear a lifejacket while snorkeling (not optional) The area for snorkeling was contained and had lots of people all scaring the fish away and stirring up cloudless. Maybe other islands are better to swim at. 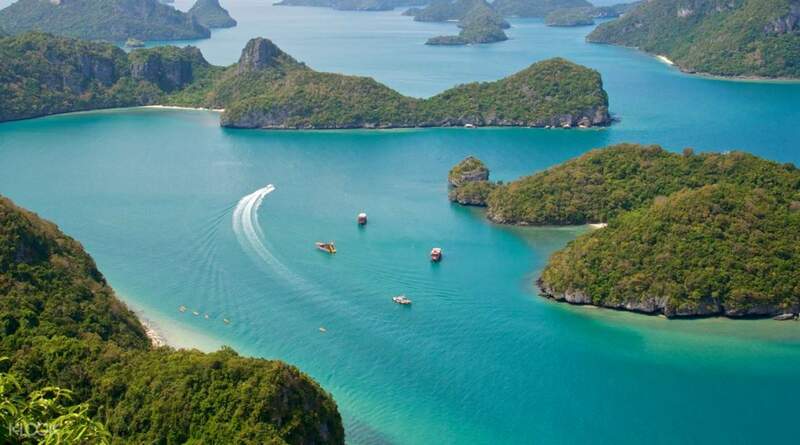 Experience a spectacular day out in the crystal blue waters of the Gulf of Thailand in this guided day tour from Koh Samui. Your day starts with a light breakfast while on board a big boat departing from Nathon pier heading to Angthong National Marine Park. You will then transfer to a longtail boat or kayak to Mae Koh Island to see the Emerald Lake, fondly referred to by the locals as Talay Nai. 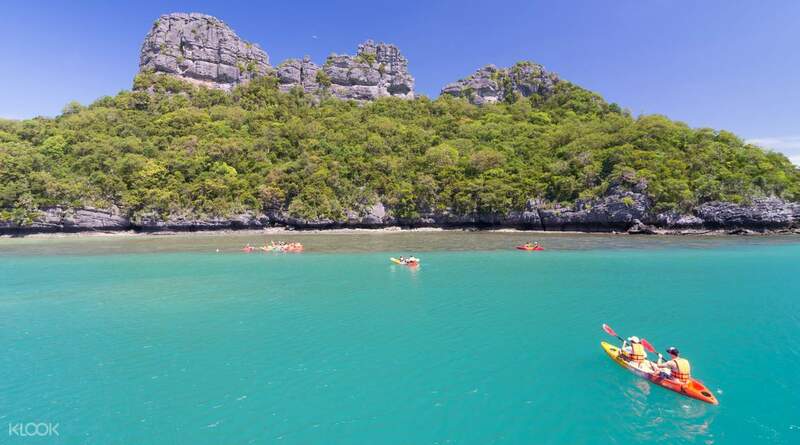 To ensure you'll be full of energy for the rest of the day's activities, you'll enjoy a delicious Thai buffet lunch before kayaking at Wua Ta Lap Island or climbing to the Top View Point or hiking across a nature trail to the Lotus Cave. 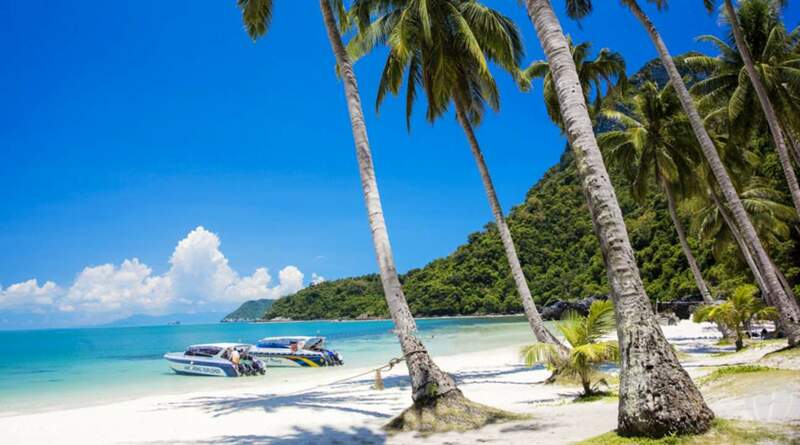 You'll also have enough time to swim or relax on the beach before boarding the boat back to Koh Samui. It's a day of fun and learning on the beaches of a marine paradise! 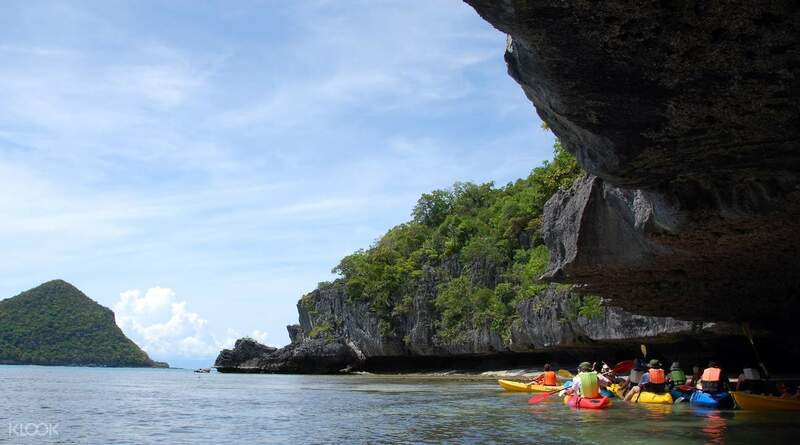 1:00pm kayak at Wua Ta Lap Island or climb to the Top View Point or hike (using a nature trail following a rope) to the Lotus Cave (Bua Boke), with beautiful stalagmite and stalactite formations. The operator will reconfirm your pick up time in advance. A fantastic, must-do day trip out of koh samui if you're traveling there. Very friendly staff, well timed activities with kayaking, snorkeling, a bit of hiking for thrilling views or just chilling at the beach! Would definitely do it again. A fantastic, must-do day trip out of koh samui if you're traveling there. Very friendly staff, well timed activities with kayaking, snorkeling, a bit of hiking for thrilling views or just chilling at the beach! Would definitely do it again. Omg best trip ever. The tour was simple. Instructions were clear. And our kids had a blast. No regrets. Just wish the kayaking was much much longer as my family enjoyed it the most! But overall kayaking hiking snorkeling swimming were so much fun! Omg best trip ever. The tour was simple. Instructions were clear. And our kids had a blast. No regrets. Just wish the kayaking was much much longer as my family enjoyed it the most! But overall kayaking hiking snorkeling swimming were so much fun! The tour is amazing!!!! it's extremely worth it!! the driver was early for the pick up and friendly. the registration was smooth and fast. The guides were amazingly friendly and answered all our queries patiently and reassured me when I was worried about that kayak activity. Ms Catherine, our leader for kayak, was surprisingly funny and made sure everyone was up to speed and safe. the view on the islands was amazing and breathtaking!!! The lunch and breakfast provided was delicious and free flow of bananas and drinks!! motion sickness pills are provided free of charge. A pro tip though, if you are planning to go up to the viewpoint, which I highly recommend, do bring a pair of good hiking shoes and a bottle of water. the climb is okay but it has steep stairs. The tour is amazing!!!! it's extremely worth it!! the driver was early for the pick up and friendly. the registration was smooth and fast. The guides were amazingly friendly and answered all our queries patiently and reassured me when I was worried about that kayak activity. Ms Catherine, our leader for kayak, was surprisingly funny and made sure everyone was up to speed and safe. the view on the islands was amazing and breathtaking!!! The lunch and breakfast provided was delicious and free flow of bananas and drinks!! motion sickness pills are provided free of charge. A pro tip though, if you are planning to go up to the viewpoint, which I highly recommend, do bring a pair of good hiking shoes and a bottle of water. the climb is okay but it has steep stairs. It was a wonderful experience. All the staffs are so nice and friendly. Even help us take a lot of pictures during kayaking. The tour guide always look out for everybody if there’s any problems. Breakfast and lunch included. Water, hot tea, coffee and soft drinks served at the all time. You and also buy beers on bored very chill. We had a great time. It was a wonderful experience. All the staffs are so nice and friendly. Even help us take a lot of pictures during kayaking. The tour guide always look out for everybody if there’s any problems. Breakfast and lunch included. Water, hot tea, coffee and soft drinks served at the all time. You and also buy beers on bored very chill. We had a great time. Pick up could be improved (more confirmation on exact pickup location could be better) Whole tour was nice due to great weather! View was amazing and there wasn’t too many people. Need to bring trekking shoes if heading into the cave! Else flip flops should be good. Trekking to the top of the view point takes some willpower and strength.. 40 mins up and 40 mins down... Did not select the kayak options since my group has kids... but Kayaking should be fun! Food onboard is mediocre though. Have some breakfast before boarding if possible! Pick up could be improved (more confirmation on exact pickup location could be better) Whole tour was nice due to great weather! View was amazing and there wasn’t too many people. Need to bring trekking shoes if heading into the cave! Else flip flops should be good. Trekking to the top of the view point takes some willpower and strength.. 40 mins up and 40 mins down... Did not select the kayak options since my group has kids... but Kayaking should be fun! Food onboard is mediocre though. Have some breakfast before boarding if possible! great tour. was afraid the operator didn't show up simce they didn't call earlier to set the pickup time earlier. but it went well and smooth. recommended. great tour. was afraid the operator didn't show up simce they didn't call earlier to set the pickup time earlier. but it went well and smooth. recommended. outstanding. great views. just that there was no time to rest between activities. reached back hotel in by 5 pm... so had a evening free. much recommended. outstanding. great views. just that there was no time to rest between activities. reached back hotel in by 5 pm... so had a evening free. much recommended. Very good experience. The tour team -the Sumai island tour is awesome. Very good experience. The tour team -the Sumai island tour is awesome. Driver was punctual for the pickup, however we had to meet at another location near where we stayed as the operator informed that they were unable to pick us up at our accommodation for some unknown reason. We departed for the tour on time, the local guide was friendly, gave specific instructions for the tour and constantly ensured that we were well taken care of throughout the tour. Food provided onboard was alright, nothing fantastic. Driver was punctual for the pickup, however we had to meet at another location near where we stayed as the operator informed that they were unable to pick us up at our accommodation for some unknown reason. We departed for the tour on time, the local guide was friendly, gave specific instructions for the tour and constantly ensured that we were well taken care of throughout the tour. Food provided onboard was alright, nothing fantastic. was super worried that it was going to rain but apparently rain is normal around ko Samui. The tour was timed just right and the best view point was worth the hike. was super worried that it was going to rain but apparently rain is normal around ko Samui. The tour was timed just right and the best view point was worth the hike.